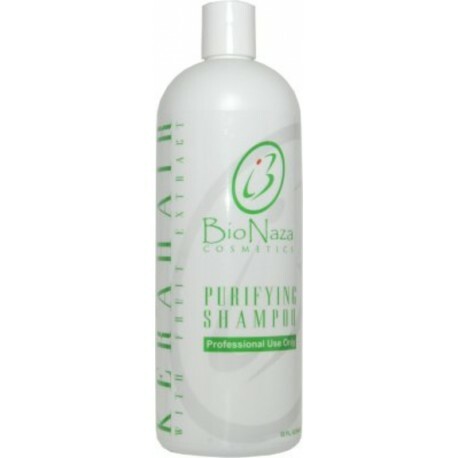 Bio Naza Purifying Shampoo 32 Oz. - Just Beauty Products, Inc.
> Hair Products>All Keratins>Bionaza Keratin>Kerahair>Bio Naza Purifying Shampoo 32 Oz. How to use: Gentle massage onto scalp and roots to remove product buildup and prepare the hair to receive the keratin treatment. Rinse thouroghly and reapply as needed. Caution: Use only as directed. Keep out of the rich of children. Avoid contact with eyes, if the product comes in contact with eyes, washes with plenty of water. Ingredients: Water (Aqua), Sodium Lauroyl Sarcosinate, Disodium Cocoamphodiacetate, Propylene Glycol, Cocamidopropyl Betaine, PEG-7 Glyceryl Cocoate, PEG-8, PEG-8/SMDI Copolymer, DMDM Hydantoin, Keratin Amino Acids,Palmitoyl Myristyl Sarinate, Hyaluronic Acid, Rosmarinus Officinalis (Rosemary) Leaf Extract, Sodium Polyacrylate, Cocamidopropyl Hydrozysultaine, Sodium Benzoate, Tetrasodium EDTA, Simmondsia hinensis (Jojoba) Seed Oil, Tocopheryl Acetate, Imidazolidinyl Urea, Fragrance.